This Bath Bench is but with a 1" anodized aluminum frame that has legs angled outward to prevent tipping. 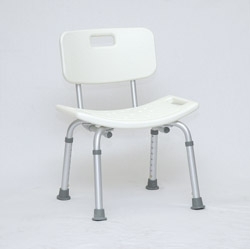 It is a blow molded plastic seat and has back drainage holes & built in handles. It has an adjustable height of 14" to 19". It has a 2 year warranty.